My dad was only about fifty at the time… In his prime, running marathons and getting ready to open his store, Bill Johnson’s Phidippides Sports, which he and Mom owned until cancer (and discount shoe stores) closed them down in April of 1997. So yeah, Dad had incredible lung capacity, but was short on patience, so blowing up that float was a greater challenge for him than the twenty mile marathon training runs he led on Saturdays. Dad died in July of 1998, and ever since then, when I’m with Mom and working on something that tries my patience, like doing her income taxes or cleaning out some of the clutter she’s cultivating in her apartment, she will get this misty look in her eyes, smile and say, “you’re making progress, Papaw!” It always gets to me. So today, when I got the phone call at 9 a.m. from Lakeland Nursing Home, saying they had a bed for Mom in their transitional unit (for people like Mom, in rehab for her broken hip) I was thrilled, but then they said I had to be in Jackson by 3 pm to do the paperwork, or pay $165 (private pay rate) to hold the bed until tomorrow. I was on the road by 11:45 am and at Lakeland by 2:45 pm. By 3:30 the paperwork was done and I was pulling away from the nursing home when I saw it. If you click on this picture of the plaque, a large version should pop up if you want to read the inscription. So he said sure and here’s the picture. It’s been raining and my hair looks awful and for once I actually don’t care. Some of you know how huge that is. The rest of you can think what you like. Dad seems to be everywhere in this city. On the calendar of events at Lakeland Nursing Home, I noticed that every Friday at 10:30 am there’s a devotional and hymn singing, led by folks from Covenant Presbyterian Church. Dad used to do that, in the 1980s when my grandmother was at Lakeland. He had a gorgeous voice… my favorite Christmas memory is of him and my Uncle Dan singing “O Holy Night” while Aunt Joy played the piano. Dad was a baritone and Dan had an amazing tenor voice. So, back to the progress. Tomorrow morning I’ll pack Mom’s things at the nursing and rehab center where she’s been since October 15 and move her to her temporary room at Lakeland. Then I’ll have 2-4 weeks to decide if Lakeland will be her final home on this earth. I’m just not sure her mind is going to recover enough for her to function well in assisted living again. If she stays at Lakeland, they’ll move her to the long-term when her rehab is finished. Oh! I forgot to mention that it’s been 5 days since I took Mom to the surgeon and returned her to rehab with DOCTOR’S ORDERS for her to have a walker and portable toilet in her room, and to begin “gait training,” which means using the walker, but only putting weight on the good leg. I’ve called her current rehab place every day since then, but still no walker and no toilet. Now, like they say at the end of every issue of skirt! 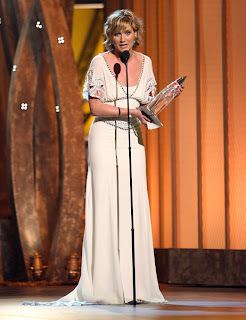 Magazine, this “issue” was put together to the music of… The 2008 Country Music Association Awards! It’s just after 9, so it’s not over, but I’ve been dancing around my hotel room to the awesome music of some of my favorite stars, like Jennifer Netttles of Sugarland, (left) whose song, “Stay” won Song of the Year and Sugarland also won Duo of the Year! (I’ve got all their CDs and have been cheering for them for years.) And my faith in mankind was restored when George Strait’s politically incorrect song “I Saw God Today” won Single of the Year. And just watching Ronnie Dunn (of Brooks and Dunn) makes my night… he is so hot. (my kids are probably freaking out if they’re reading this, thinking ugh, those old people are so weird!) 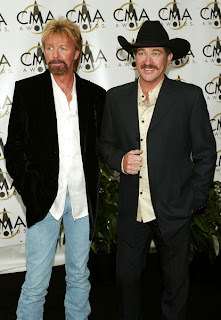 That’s him, in the jeans, no hat, (great hair) with his partner, Kix Brooks. They sang “Cowgirls Don’t Cry” from their CD, Cowboy Town, which I listened to while driving to Jackson today. And talking about old people… I’m still waiting to hear The Eagles perform, but they’re really my husband’s favorite group. In fact, he bought tickets for us to hear them in person this coming Sunday night at the Fed Ex Forum in Memphis. I’m wondering what this classic rock group is doing at the CMA awards show…. yeah, my husband loves rock. CMA host Brad Paisley just said the Eagles “dug the well” … of rock and roll and country? I’m going to have to think about that one…. and now I’m listening to them singing “you were just too busy being fabulous... to think about us.” Sounds like the lament of the entire Baby Boomer generation, but it doesn’t sound like country music. These are the guys who sang “Hotel California,” remember? If this is the Eagles, clean and sober, I’m a little worried about Sunday night’s concert…. but of course, it will be worth the price of the ticket just to hear them sing “Desperado,” with my Eagle-groupie husband… when he gets back to Memphis from this week’s trips, to New Orleans, where he gave two talks at the American Heart Asssociation’s annual meeting, and from there to New York City for another meeting today and tomorrow. Yeah, he’s pretty busy being fabulous. You better let somebody love you…. (that would be me).